Finger Paints has done a really different type of Holiday collection this year. None of the predictable reds and greens and golds commonly seen this time of year, but instead the Merry and Bright collection contains a selection of bright colors and glitters for layering. Comet's Collar. A light metallic yellow-toned green. This is made of medium-sized shimmer particles in a subtle mix of colors- some yellowy, some iridescent, some gold. It gives the polish a textured shimmery look with glints of iridescent color when the light hits it just right. Drummer Boy. A light blue glitter in a clear base. This is your standard type of glitter particle- big, round, silver-based. The blue coating looks lighter or darker depending on the angle, and is very shiny in a chrome-like way, but isn't actually very sparkly. Frosty Night. A plain silver glitter in a clear base. Like Drummer Boy, this glitter is shiny but not sparkly. It's actually rather dull looking, it doesn't come alive in the light like normal glitter. This is probably my least favorite silver glitter ever. Santa Kisses. 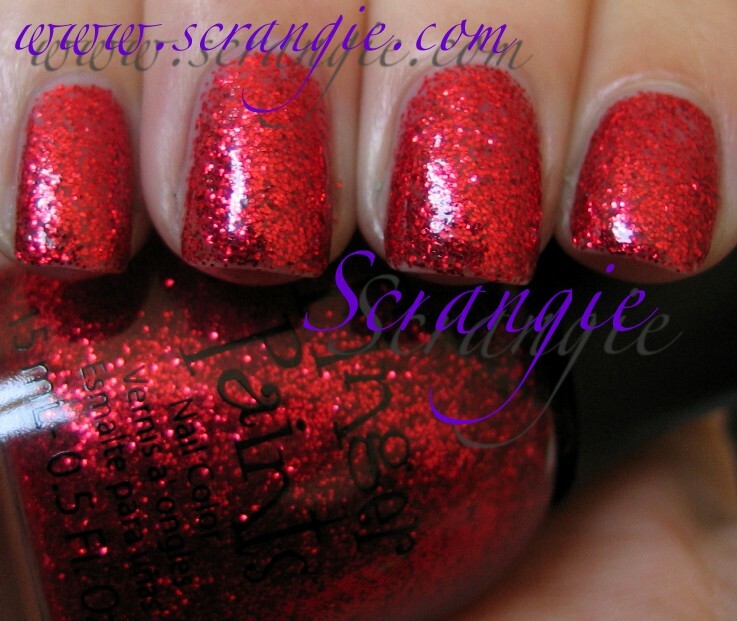 A red glitter in a clear base. This one isn't as shiny as the others, and it's not sparkly, either. It's colorful, but it's dull and lifeless. Winter Sky. Under winter skies, we stand glorious.... Winter Sky is a very unexpected bright but soft blue with gorgeous electric aqua shimmer. It doesn't look like much inside, but the shimmer really comes out in sunlight. Yule Be Merry. Another really unexpected color. Bright magenta with pink and purple flash. Just for fun, this is what my label for this one said. I know it's not the real label because it's a sample, but it still made me smile. I love typos on polish bottles! This is one coat of Drummer Boy over Winter Sky. Much better layered, but still no sparkle! Just shiny metal plates. The formula on these was somewhat hit and miss. The glitters were thick and a bit goopy, but the shimmer shades had a fairly even, albeit rather thick, formula. Winter Sky was opaque in one coat, the rest needed three. I'm wearing three plus topcoat in these pictures. Drying time is long due to the thickness of the formula. I have to say... I'm disappointed. I liked these better in the promo pictures because they looked more sparkly and colorful. In real life, they're just... Eh. The shimmer shades are nice, but I would personally pass on the glitters. They're really sheer and they don't sparkle. I do appreciate that they decided to think outside the box and not do the stereotypical red/green/gold-themed Holiday collection, but I gotta tell you... I miss those stereotypical holiday colors! I love those velvety, vampy reds, sparkly silver and gold glitters, blackened evergreens and snowy whites. To me, this collection feels like a random assortment of colors leftover from other collections. Maybe I'm being too harsh, but none of these colors really stand out to me or draw me in. This is the first Finger Paints holiday collection I haven't liked. In my opinion, each year Finger Paints does one of the prettiest holiday collections out of all the brands (see 2010, 2009, and I haven't reviewed it, but here's 2008 for reference). This year's collection seemed to lack that holiday magic and sparkle that the Finger Paints holiday collections always have. Anyway, these will be available starting in November exclusively at Sally Beauty. They're pretty, but I've seen most of these shades with China Glaze I think. 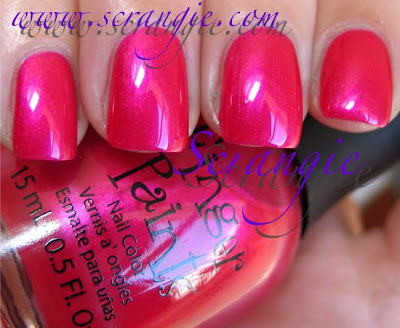 That pink definitely since I was looking up swatches for similar shades from China Glaze. This is just not what I've come to expect from Finger Paints. Every year I get excited about the Finger Paints holiday collection, but these? Meh. They're okay, but not a single one of these has created a lemming. LOVE the blue and the pink. LOVE!! I'm over the big, chunky glitters already. I liked your layering experiment, Scrangie! Looks pretty! Reds do nothing for me, and I've got pleeennnty of blue and silver glitters, but I'm digging Comet's Collar! Interesting texture /color combos on that one. I do love the green & the blue. I like winter sky the best!!! Good review. I bought Finger Paints Comet's Collar and it's gorgeous. It has a super thin formula so I put 3 coats on and then put one coat of China Glaze Twinkle Lights and got a super sparkly combo. I also got Winter Sky but the brush fell out of the cap and when I went to return it that was the case with all the other blue bottles! It looks pretty. Yes I see what you mean the past collections were way better especially the thanksgiving looking glitter from last year man was it beautiful! the only one I think I will pick up is winter sky. Thank you for your gorgeous swatches and pictures.